U.S. retail sales of Class 8 trucks jumped 23.3% in June to the highest point this year, climbing above 21,000, WardsAuto.com reported. But analysts said the gain came not so much from increased production but reflected deliveries of some trucks that mostly had been finished but were awaiting parts. Sales reached 21,351 compared with 17,310 a year earlier, according to Ward’s. Some recent estimates point to 10,000 red-tagged trucks awaiting completion, with more being added each month behind the fences. Year to date, Class 8 sales climbed 30.5% to 110,025. Another analyst said he has been told supply chain issues are worsening somewhat. 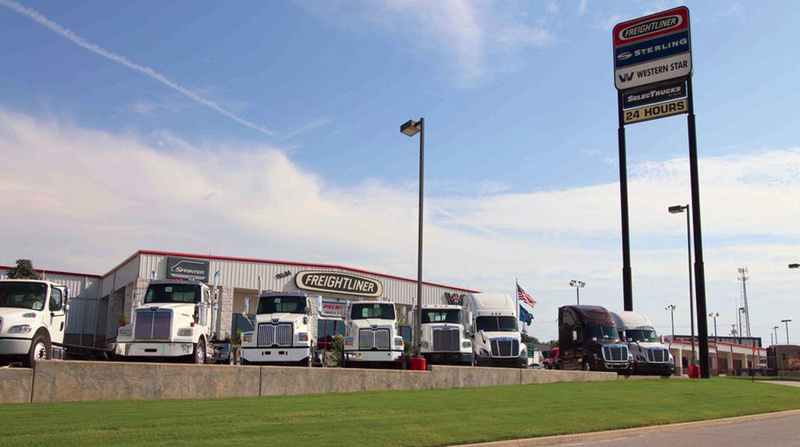 Meanwhile, Freightliner remained the market leader with a 35.9% share in June. It sold 7,672 trucks, up 21.5% from a year earlier. Year to date, Freightliner’s leading market share fell 2.2 percentage points to 35.6% compared with the 2017 period. “Notably, dealers that we spoke with stated that the limited availability of Freightliner trucks has made it possible to slightly increase prices,” Neil Frohnapple, director of equity research for Buckingham Research Group, wrote in a recent note to investors. Freightliner is a unit of Daimler Trucks North America. International Truck saw sales swell 45.7% year-over-year to 2,492 for an 11.7% share. Compared with 2017, its year-to-date share rose 2.6 percentage points to 13% — the largest increase among all truck makers in the first half of 2018.
International is a brand of Navistar Inc.
“All the markets are strong, but [demand] is primarily being driven by on-highway fleets,” said Steve Gilligan, Navistar vice president for product marketing. Volvo Trucks North America in June posted a leading 56% increase to 2,542 trucks, good for an 11.9% share. Its year-to-date share rose 1.7 percentage points to 11.3% compared with the 2017 period. “The historically hot Class 8 truck market, coupled with the strong acceptance of our new VNR regional haul and VNL longhaul models, continues to fuel demand,” said Bruce Kurtt, VTNA senior vice president of sales. “We don’t anticipate the pace slowing, particularly as freight volumes and rates remain strong and carriers seek premium comfort and productivity features to help attract and retain the best professional drivers,” he said. Many fleets also are investing in active safety and connectivity systems, Kurtt added. Mack Trucks saw June sales rise 14.9% year-over-year to 2,026, good for a 9.5% share. Its year-to-date share slipped 1.5 percentage points to 7.8% compared with the 2017 period. “We’re seeing strong freight volumes and an increase in construction activity as a result, including a sharp increase in housing starts and higher overall construction spending,” said Jonathan Randall, Mack Trucks senior vice president of North American sales and marketing. “We’re now seeing a positive trend in retails as our significant order backlog translates into truck sales,” Randall added. VTNA and Mack are brands of Volvo Group. Peterbilt Motors Co.’s sales climbed 19.7% to 3,328 and a 15.6% share. Year to date, its share dipped 0.5 percentage point to 15.4% compared with 2017. Peterbilt and Kenworth are units of Paccar Inc.
Western Star, DTNA’s niche name plate, saw sales slip 3.2% to 542 trucks, good for a 2.5% share. Its year-to-date share dipped 0.2 percentage point to 2.6% compared with the 2017 period. Tam said more months with year-over-year higher sales will come.